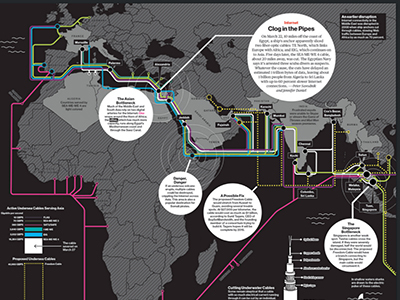 This infographic from Bloomberg Businessweek illustrates the impact of a physical disturbance to two fiber-optic cables linking Europe to Africa and Asia. As a result, an estimated trillion bytes of data have been delayed, leading to up to 60 percent Internet connections for up to 1 billion people. 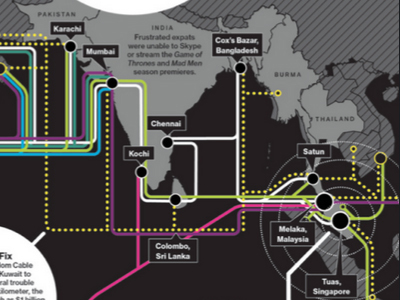 The diagram illustrates the active undersea cables serving Asia and their estimated capacities, as well as bottlenecks and possible fixes for the network vulnerabilities revealed by the incident.